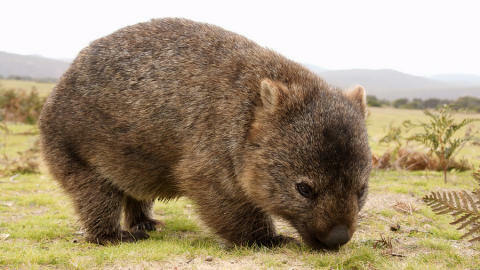 Wombats are short, furry marsupials that can only be found in Australia. 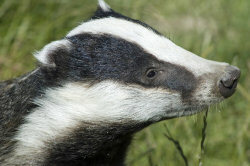 They can grow up to 1m long and have short, stubby tails. Wombats burrow, using their front teeth and sharp claws, and they retreat underground at first sign of a predator or bush fire. They are herbivores. Fun fact: Wombats carry their young in a pouch which is cleverly designed to face backwards, so that they don't cover their babies with mud while digging! 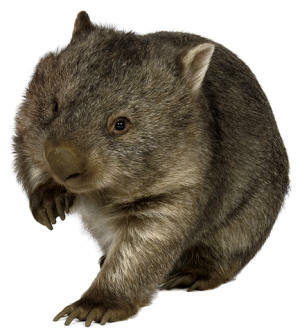 Scroll down to enjoy some wombat videos, and click the links to discover our wombat resources below. We currently have some useful notebooking printables, with a fun colouring page and printables for younger children in the pipeline. Why not spend a little time learning how to draw your own wombat today? They look pretty cute and cuddly - although I gather the last thing a wild wombat wants is cuddles! Have some fun writing a WOMBAT acrostic poem! Choose from four variations of printable, two with illustration and two blank for your own. They also make a good writing frame for younger children. These little printable booklets are perfect for your child to use to write about the Australian animal, draw pictures or even make up a story! Choose from lined or blank booklets and then just click the links below to download and print. Here's a lovely, somewhat "realistic" picture of a wombat to colour in! Wombats are usually brown, and live in burrows in Australia. This colouring page features a very cute example, aimed at younger kids. Copy the picture of the wombat, square by square, to the blank grid on the right side of the page. It's a great way to learn to draw a wombat, while practising your counting and copying skills! Children can first trace, then write by themselves, the word "wombat". Fun for an Aussie animals theme! Use our printable notebooking pages to record what you have learned about the wombat, one of Australia's unique animals. Choose from two designs, and just click on the links below to download printable versions. Here's a lovely poster of a wombat for your Australian animals project, or to display. We have two versions, one with word and one without, to choose from. This cute wooly wombat poster will look great on your wall, and he's a good shape for cutting out too. Colour in this fun scene of two wombats enjoying some Australian sunshine! This lovely colour poster of our wombat scene - two wombats chatting in the Aussie sunshine - would look fun on display in a classroom, playroom or children's bedroom! Trace the letters of "wombat" and colour in the cute picture, perfect for younger children. Find out some facts about the wombat, Australian's amazing digger, and use them to fill in this fun worksheet. Use our illustrated writing page for collecting facts about wombats, or other wombat writing projects. Colour or black and white writing pages are available below.